I titled the project "Beacon to the Community" with the understanding that most people would view the art glass windows from outside of the building. The windows are located on three sides of a two-story stair tower and are designed to light up at night like a lantern. 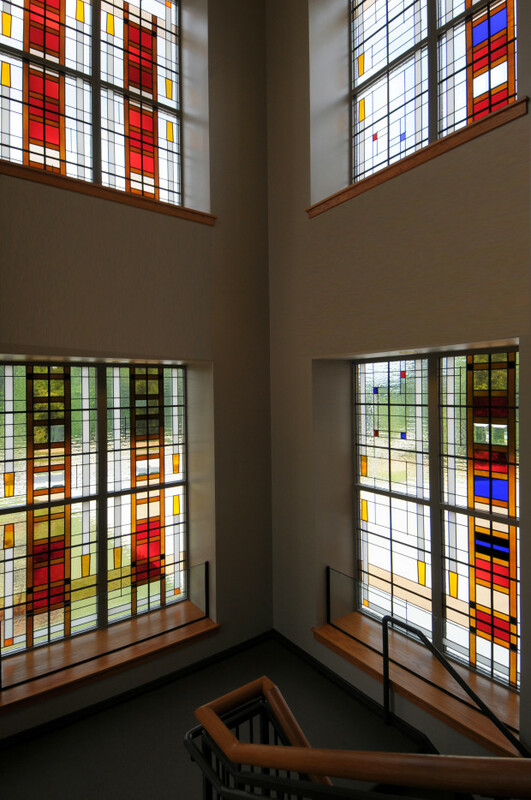 The six windows are each 6' wide x 10' high and built from hand-blown and hand-rolled glass with details of hand-beveled plate glass and dichroic glass. The Fire personnel sleep upstairs and they have the option to take the stairs up and down, or a fire pole down. 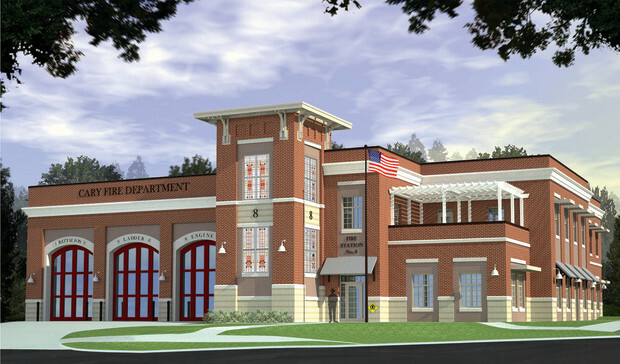 The design of the newly constructed building is reminiscent of a vintage fire house with its two-story hose drying tower. I matched the graphic style of the architecture with the art glass design, so it at first appears to be architectural detailing; however, upon closer inspection one realizes it is abstracted brown ladders, white hoses, and gold nozzles. To further the concept, I used a water glass textured background to complete the tools required for fighting fire. 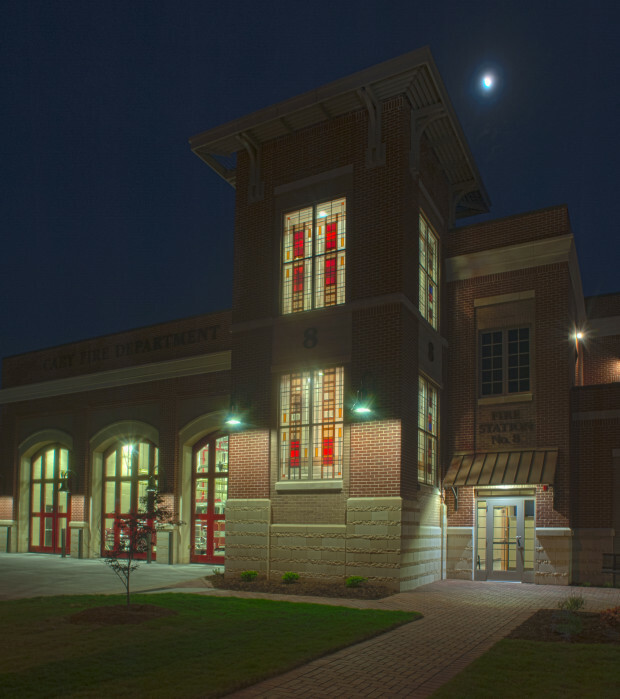 Cary Fire Station #8 also houses a police substation; therefore, the art glass design contains symbols for both fallen fire personnel and police officers as well as colors relating to each department. The art glass was designed with the intention of adding color and a human scaled detailing to the architecture. I met with the architects, art committee, public art coordinators, contractor, and two sixth grade art classes at a nearby public elementary school to field criteria for designing the project. I also visited the Cary Historical Museum and the Cary Fire Department Archives as well as the building site. Based on these meetings I was asked to create two design options for their consideration. For continuity with the architecture both designs started graphically with a grid matching the divided panels of the window frames in the rest of the building. One of my designs depicted the history of the Town of Cary and the second design (which was selected) abstractly depicts the tools of the Fire Department and other related symbols within a larger composition. I added my art glass designs to the architect's rendering of the building exterior, and created both interior elevation drawings and perspective drawings to communicate my design concepts for the presentation on my return trip to Cary. The 24 individual panels were fabricated at my studio in CA, then crated and shipped to NC where I collaborated with local installation specialists and the contractor to complete the project. This is the first LEED energy efficient building in the State of NC and the art glass was designed with special thermal break framing and exterior glazing to be part of this program. The detail photo looks through the art glass to the flag at half mast. 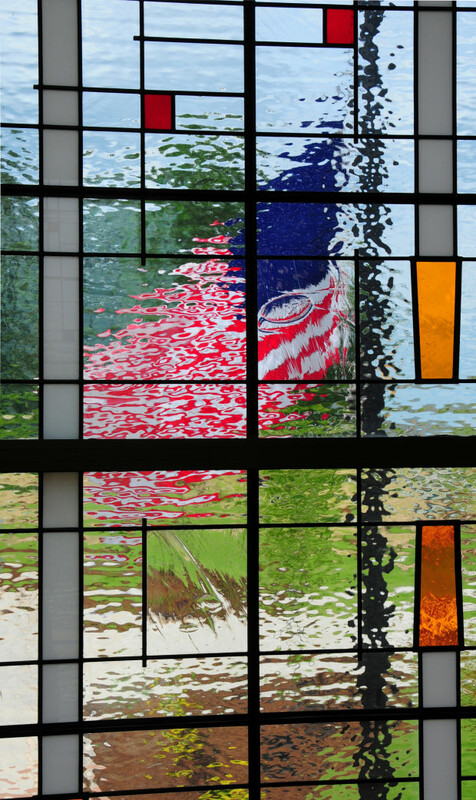 It just so happened the day I was there for the building dedication one of the previous State Governors had passed away, and the flag was directly outside the windows beautifully abstracted through the various textures of the art glass.